As I continue trying to get healthier, I stumble across these reasons core strength is important for weight loss in almost every magazine I read. My sister and I are both magazine hoarders at times, and we share back and forth. I love her large variety of reading material. Especially since I have been really trying to improve my own health this year. I truly want to drop some weight and become a healthier mom. As I exercise, I have found everyone always saying, “make sure to work on your core”. Since my core is where my largest amount of extra weight is – I am definitely always well aware of my core. But why is it that people are always telling me how core strength is important for weight loss? Helps support you spine resulting in fewer injuries. 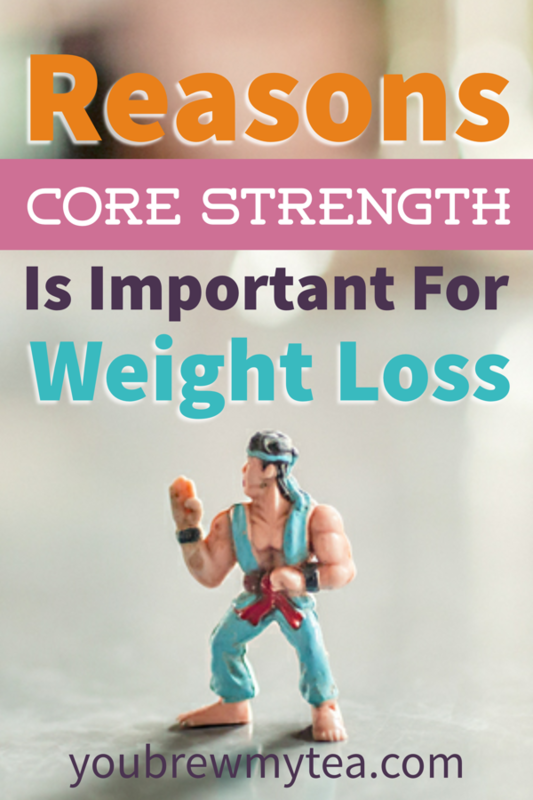 Ultimately, this is the biggest of reasons core strength is important for weight loss. When the muscles around your spine are strong, your spinal column is safer. This means you are less likely to have an injury that could leave you in chronic pain. Had my core been stronger, my previous back injury might not have happened, or at least not been so bad. Your core is basically the muscles around your mid-section. The abdominal and back muscles are key to holding your body upright. As someone who carries the bulk of her extra weight on her midsection, I totally understand how stronger muscles would make it easier to do things like simply walking or even lifting. Adding more core exercise will strengthen your abs as well as your back. The result is your spinal column is stronger and safer. Fewer chances of a herniated disc or even things like sciatica nerve pain. For someone who struggles with extra weight, chronic pain and the fear of that horrid back pain coming back, this is seriously important for me. I just want my abs and back to be stronger to support my body. A bikini stomach would be great, but at the core of my reasons core strength is important for weight loss have a lot more to do with staying strong for longer periods of time. A strong core makes other exercise easier. When you are trying to lose weight, exercise is a huge part of that. When your core is stronger, you will find almost every other exercise will be easier. Easier means you can do more and will have better results. A strong core is definitely a great way to improve your overall weight loss experience and goals. It’s always nice to look thinner, have better posture and have six pack abs. However, health is way more important than vanity, and when it comes to core strength it is all about helping improve your health. Supporting your spine will result in a much stronger body. I realize that my favorite exercise of late, swimming, isn’t building as much core strength as my body likely needs. So that leaves me with questions about what is safe for my back? Having had a lumbar laminectomy in February 2015, I am still always well aware of the painful consequences if I do something wrong. I think it is once again time to consult with the experts (aka my sister and brother in law) to help me chose some safe exercise to build my back and abdominal strength. Check out our other fitness tips for those who are plus sized or have chronic pain issues!